Debate is an important part of the classroom experience. However, most debate-style readers do a disservice to students by selecting readings from disparate sources that end up talking past one another. As a part of the Debating Politics series from CQ Press, this reader is different. Featuring paired pro/con pieces written specifically for this volume, Debating Terrorism encourages students to actively grapple with the central debates and questions surrounding the subject of terrorism and counterterrorism . 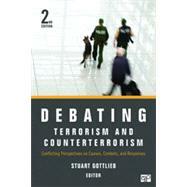 With topics ranging from the root causes of terrorism, the role of religion in terrorism, whether suicide terrorism is ever justified, whether the spread of democracy can help defeat terrorism, and what trade-offs, if any, should exist between security and civil liberties, Gottlieb's outstanding cast of contributors returns in this edition, compelling students to wrestle with the conflicting perspectives that define the field. Gottlieb frames the complexity and sophistication of these issues with incisive chapter headnotes providing students with the requisite context and preparing them to read each argument critically, allowing them to understand the past, present, and future of terrorism and counterterrorism. Each of the selections has been thoroughly updated to account for recent world events, policy changes, and new scholarship. New to the reader, and by reviewer request, is a chapter, Can Global Institutions Make a Difference in Fighting Terrorism?